For several years we’ve all become quite familiar with LED flash lights how little energy they take to operate. Over the same time period I’ve been waiting with great anticipation for the day that LED technology finally reached a point where our homes could also take advantage of it’s energy efficient benefits. Well I’m very excited to say that day is finally here and we’ve had the opportunity to work closely with The Home Depot to showcase exciting new LED lighting options for your home. Did you know that reducing your energy bill can be as easy as replacing your light bulbs? According to the U.S. Department of Energy, lighting consumes nearly 15 percent of a household’s electricity use, and new lighting technologies can significantly reduce energy use at home. Replacing incandescent bulbs with energy-saving lighting options, such as LED lights, is a simple way to reduce your energy bills. Replacing standard light bulbs with energy efficient LED bulbs will bring you immediate savings on your electricity bill. In fact, innovative LED technology uses up to 85 percent less energy than incandescent bulbs, without sacrificing lighting quality. LED bulbs supply just as much light as your old bulbs but use far less electricity. In fact, the innovative technology uses up to 85 percent less energy than incandescent bulbs, and up to 50 percent less energy than CFL bulbs. LED bulbs also have an exceptionally long life expectancy that is 100 times longer than incandescent bulbs. Each bulb can last up to 100,000 hours, or 11.42 years. 1. Identify Your Fixture Type: With so many bulbs to choose from, it’s important to educate yourself about your fixture and lighting needs before you make a purchase. Light fixtures can dramatically alter the look of a room, so be aware of where shadows will fall and how that will affect the atmosphere. To ensure safety, and the maximum life of your bulb, review the information on the package to be sure you have selected the correct bulb shape for your light fixture. 2. Choose Your Desired Brightness:Watts, a measurement of power, is a common way traditional light bulbs are identified (ex: 60-watt, 75-watt and 100-watt bulbs). Since CFL and LED bulbs use less energy than traditional bulbs, be sure to look at the measurement of light output, known as lumens, instead of watts to select the right bulb. 3. Understanding Color Temperature and Intensity: When selecting an LED light, choose a color of light that suits the mood and activity taking place in your room. 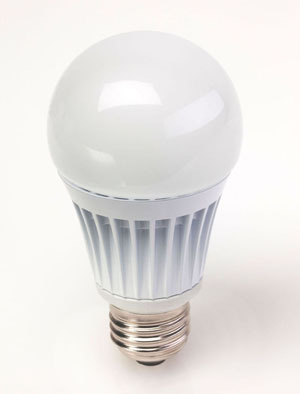 The Home Depot now offers a proprietary brand of LEDs under the EcoSmart name, including a bulb that retails for $19.97 and is a 40W equivalent, offering 429 lumen with a 50,000 hour expected lifetime, making it the most affordable bulb of its kind in the market to date. In comparison, just two years ago, a 60-watt equivalent cost $90 and a 100-watt dimmable bulb went for $360. In addition, THD will offer LED bulbs that support many different types of fixtures including: accent lighting, track lighting, room lighting, outdoor spotlights and all are fully dimmable. In our next article on LED’s we’ll share our shopping experience at The Home Depot. We’ll show you some of the great LED products that are available and which ones we choose to install in our home. 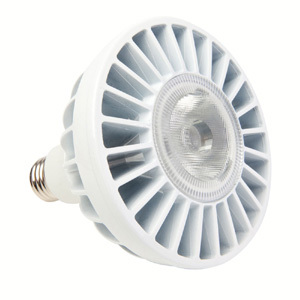 We’ll also be writing an article showing how to install the EcoSmart Downlight. Do you have an LED bulb you could recommend that doesn’t take a long time to “warm-up.” The ones we have in our hallway don’t fully turn on until you’re on the other end of the hallway. Robin – The ones that I installed this weekend EcoSmart (I’ll be writing a review shortly) work VERY well.